I just want to let everyone know that I have updated my want list this week, and it includes the 2009 Topps Series 1, and 2009 Upper Deck Series 1. 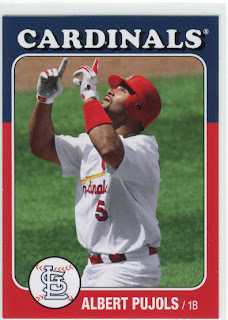 I am going to compile a list for the 2009 Topps Heritage soon. Clicking on the link at the right will take you to my want list. I was able to pick up some cards from UD through trades, and cheap auctions on eBay but there are still plenty that I am missing. Please let me know if you have anything of interest, I will be more than happy to negotiate a trade. That is the regular size one. This is one of my favorite Pujols shots, the after homerun one. I generally like the design of these, though this is the only one I have actually had in hand. They seem to fall at a very sparse rate of 1 or 2 per boz from what I have noticed. Most of the inserts from this set are going for around $3 of Albert. The other thing about the UD Series 1 is that the Starquest cards are only in retail packs, and there are way too many versions of these cards. Couldn't agree more about the Starquest. Me thinks UD has found a way to get even player collectors to bust more useless packs to get ALL variations of their favorite player. This makes me sad.